Fresh diplomatic tensions are on the rise between India and Pakistan over the Mumbai massacre, as Islamabad remains unmoved by a dossier of evidence presented by India purporting to show involvement by Pakistanis in the raid. Pakistan this week did admit that its investigations have confirmed that the sole surviving gunman involved in the November attacks is a Pakistani citizen  a fact that the government had refused to acknowledge until now. But New Delhi is demanding a lot more of Pakistan, and the reluctance of Pakistan's security establishment to have the history of its involvement with jihadist terrorist groups opened to international scrutiny makes it unlikely that Islamabad can meet India's demands. Analysts believe that the reversal of Pakistan's denials on Kasab may be a concession to mounting international pressure. "I think they had no choice, because their credibility was getting worse day by day by being in a state of denial," says Talat Masood, a retired general turned political and military analyst. "As pressure built up from India, the U.S. and the U.K., they had to accept the fact. It's a shame, really, that they waited so long. If they had done so immediately, it would have helped Pakistan's image." Although fears of war have subsided over the six weeks since the attacks, tensions returned to a boil this week when India's Prime Minister, Manmohan Singh, bluntly accused "elements" within the Pakistani state of complicity in the Mumbai massacre. India on Wednesday reasserted that it was "keeping all options open"  words taken by Islamabad to mean the possibility of military strikes by India on suspected militant targets in Pakistani territory. Masood believes that the admission on Kasab may help tamp down the renewed war of words. "It will help, at least in the sense that India could start thinking that Pakistan is coming around," he says. "Until now, they have acted from the position that it is not." Singh caused anger in Pakistan when he charged that the sophistication and scale of the attack meant that "it must have had the support of some official agencies in Pakistan"  widely seen as a reference to Pakistan's military intelligence organization, the ISI, which has a long history of cultivating jihadist groups. India also reiterated its demand that suspects arrested in Pakistan be extradited to stand trial in India. On Tuesday, Pakistan's Foreign Ministry "emphatically" denounced Singh's allegations. "Vilifying Pakistan  or, for that matter, any of its state institutions  on this score is unwarranted and unacceptable," it warned in a statement. "This is a sure way to close avenues of cooperation in combating this menace." Pakistan is also unlikely to reverse its refusal to extradite suspects to India. A senior Western diplomat says that in light of the "sensitivities involved," the U.S. and Britain would support Pakistan's position that the suspects should be prosecuted in Pakistani courts. Analysts believe that such sensitivities include a fear of antagonizing the military establishment over what trials in India could reveal about the ISI's role in cultivating anti-Indian militant groups. Washington and London's acceptance of Pakistan's position in this instance may be a concession aimed at encouraging greater counterterrorism cooperation by the Pakistani military establishment; pressure on Pakistan to submit to Indian demands on extradition could spark public opposition, impede the investigation and even hurt Pakistan's cooperation in counterinsurgency efforts along the Afghan border. A similar reluctance to antagonize the Pakistani military establishment resulted in Washington's accepting Pakistan's refusal to allow disgraced nuclear scientist A.Q. Khan to be interrogated by U.S. investigators regarding his nuclear-proliferation activities. Khan remains under house arrest in Islamabad, writing newspaper columns. Pakistani officials said they were continuing to examine the contents of the dossier of evidence provided by New Delhi on Monday and leaked to the Hindu newspaper. 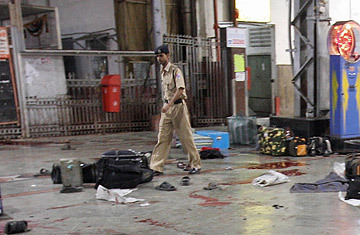 The widely publicized dossier offered details of the attackers' identities, transcripts of chilling telephone-call intercepts, photographs of materials discovered in the boat that the attackers used, and Kasab's confession. It arrived in Islamabad after persistent demands that Pakistan be provided directly with credible evidence. But on Tuesday, the Pakistani Foreign Secretary told an Indian television news channel that his government would like more information to be handed over.